Yikes! I haven’t updated in a while. I have been busy though. I put a lot of time into Skyrim. I’ll probably write something about it. 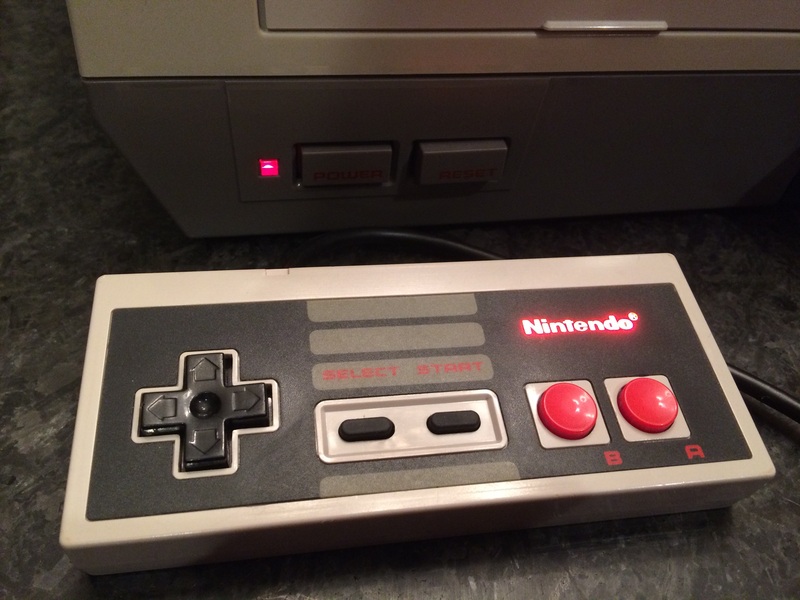 I’ve spent some time working on some hardware stuff, including this fun NES controller modification. I’m also ramping up to selling some modded original Xboxes. As for games, I’m considering a few to play next. Maybe a JRPG. A few months ago I stumbled across a red Play It Loud Game Boy in a Goodwill. It was in very good condition. Unfortunately, it wouldn’t run off batteries. I was able to fix it. I recorded a video of the process. I suspected that the problem had to do with the battery contacts. It appeared that some batteries had leaked on them at some point. It turned out that was the problem, and now it works great! I found this sucker at a local Savers the other day. Second, it is an A/V switch. It’s got 4 inputs and one output. Component, S-Video and L/R audio. That’s kind of cool. What’s very cool is that this switch will switch to the input that’s being used. I’m sure there’s a priority for the ports if multiple inputs are sending info, but I haven’t messed with that yet. That right there made it worth the $3.99 or so I paid for it. I hate having to change TV inputs, A/V switch inputs or worse, both. It does require a center-positive 9V power supply. I have a collection of wall warts in my garage and found one that worked. Third, you’ll notice that it has a cable coming out the side. This plugs into the 4th controller port on the Xbox, allowing it to be used as DVD player. In fact, this thing includes a remote. That’s not terribly useful (I don’t really use DVDs for anything anymore, and I wouldn’t put the wear and tear on an Xbox DVD drive anyway), but the remote might come in handy with a soft-modded Xbox. Fourth is something weird and almost entirely useless. It’s got a front tray that opens up and allows you to store discs. That’s all it does. Anyway, I just wanted to write about this because it was weird. I haven’t found much info on it on the internet. I’d like to figure out how to program the remote, but no luck so far. I’m probably going to set it up in our guest room. I’ve been busy for the past month or so, but I have played some Chrono Trigger. I’ve just visited the End of Time for the first time (wait … that’s super-confusing) and gone back to the time period where the game began (1000 A.D. — what does A.D. and B.C. mean in this game’s universe?). I don’t have much to say except that it’s been fun so far. I still think the Back to the Future moments are ridiculous and make absolutely no sense — if Marle’s presence in 600 A.D. meant that her ancestor was killed, thus meaning Marle was never born, then she couldn’t have gone back in time to inadvertently get her ancestor killed. And she sure as hell wouldn’t have faded from existence. But, you know. With these games it’s all about the gameplay, right? And that part is pretty good. It’s a little on the easy side so far. I have to say that I really don’t like the silent protagonist thing. I’ve never liked it in Zelda. I kind of like what Halo did — the character has a voice but no face (he’s always wearing his helmet). Making the protagonist silent just leads to awkward moments in dialog, where it’s clear that the character is talking, but the game isn’t showing me that text to preserve the silence. Still: it’s classic, mid-90’s JRPG fun. And I’m going to beat it this time, damn it. Also, I got to see the first cut-scene, which is shown when you find Robo. It was all right, but it doesn’t really add much to the game. So as I said, I’ve been busy, which is why I haven’t made a ton of progress. I’ve been working on and off on a garage workshop. It’s shaping up nicely, though progress has been slow. As for gaming-related projects, I’m almost finished with the Dreamcast VGA mod. I’ve just got to modify the console shell to accommodate the VGA jack. The Gamecube region mod is done, but I’m not done painting it. I installed a mod chip in one of my Sega Saturns and it works great. I haven’t done a region mod to it yet. I also made a completely home-made Turbo Booster for my TurboGrafx-16. That is, I made a peripheral that can be plugged into the expansion port to output composite video and stereo audio. I’ll post some pics and info on that. I may even do an instructable for it. Actually, I’ll share the results of most of those on here at some point. And I’ve worked on a couple soft-mod things that I may discuss later. My PS3’s hard drive crapped out a couple of weeks ago. Luckily I had already picked up a new drive, as I was running out of space. However, the old one died before I could back it up. That means I lost a lot of saved games, including Final Fantasy XIII-2. I’m not happy about this. However, I was in a bit of a rut, so now I’m going to change things up. I’ve started playing Chrono Trigger. I’ve played Chrono Trigger many times over the last 15 years or so. I’ve never actually beat it, though. I played the original on SNES in the late 90’s. I was borrowing it — sadly, I never owned it — and I gave it back before beating it. I did get very far into the game, as I recall. Later, I played it a bit in an emulator, then the PS1 re-release. But for all those times I played it, I never finished it. So now I’ve decided: I’m finally going to do it. I have two realistic options: the Virtual Console version on my Wii U (in Wii mode) or the DS version. I think I’m going to do the DS version. While the VC version is an exact duplicate of the original game, I think I can get more play-time in with the DS. Plus, the DS version has nifty cinematic cut-scenes. Oddly, I actually did beat its sequel, Chrono Cross. I’ve heard some people say that it’s inferior to Chrono Trigger, which I think is unfair. It was a fantastic, if occasionally confusing game. It’s been over 10 years since I’ve played it either, though, so I can’t say for sure. I’ve only just started Chrono Trigger. I’ve just met Marle and I haven’t done the first bit of time travel yet. Speaking of time travel (the main plot device of the game), I’ll try to restrain myself from going off on the insane lack of logic of its use in this game. I’m just going to go with it and enjoy it. All of these are in various states of completion, except for the SNES and NES mods. I’m also planning on building custom NES and Genesis joysticks. I might do an SNES one later, but I want to start small. The custom Atari joystick was fun, but I’ve got some gripes. It lacks heft — it feels far too light. I also don’t like the button; it just doesn’t feel right. So I might revisit that. In any event, I’ll let my mistakes there help me do a better job on future ones. I’ve got some better tools to work with now too.